In the 1960s, the city of Holland, Michigan spent about $450,000,00 to reassemble and restore the 240 year old De Zwaan windmill, a grain grinding windmill which like many older windmills in Europe, had been damaged during World War II. The City of Holland also kept two promises to Dutch leaders. One promise said that De Zwaan had to be kept open hours so the general public could learn from it. The City of Holland also promised that De Zwaan would stay open as a working windmill. Diek Medendorp strengthened the friendship chain between Vinkel, Holland, and Holland, Michigan, by tearing down and rebuilding De Zwaan. In 1964, third generation miller and millwright Jan Diederik “Diek” Medendorp, dismantled the De Zwaan, Dutch for “the swan,” windmill in Vinkel, a small Dutch town. He placed the blades in the traditional “mourning position” by guiding the blade slightly left of the vertical, rotating counterclockwise. Diek Medendorp was a living link in the chain of time and tradition connecting the Netherland with Holland, Michigan. The first links were forged in 1847 when Reverend Albertus C. Van Raalte and his flock of 60 Dutch Calvinists crossed the Atlantic Ocean from Rotterdam, Holland, to New York in 47 days, with the goal of buying land in Wisconsin. Bad weather forced the group to stop in Detroit where they heard about land for sale in West Michigan. On January 1, 1847, Reverend Van Raalte reached the banks of Lake Macatawa and bought land, and the first group of settlers arrived in what was to become Holland, Michigan, on February 9, 1847. The Dutch immigrants made new lives in their new country, but they didn’t sever ties with their old country and they passed on their traditions to new generations of Hollanders. In 1961, Holland businessman Carter Brown and Holland resident Willard Wichers, who had been United States director of the Netherlands Information Bureau and their colleagues were looking for a symbol of their Dutch roots and a visible link from the Old World Holland to the New World Holland in Michigan. To their collective way of thinking, a windmill would be a perfect symbol. They investigated and discovered a windmill called De Zwaan, Dutch for “graceful swan,” which had been built in Zaandam near Amsterdam in 1761, or according to other sources in 1776. Carter Brown and his Holland associates authorized $450,000 in revenue bonds and they finally received permission to remove DeZawaan, one of the Netherland’s ancient windmills and transport it to Holland, Michigan. The task of acquiring an authentic Dutch windmill didn’t move along as smoothly as wind filled De Zwaan sails. Willard Wichers and his group made several trips to the Netherlands searching for a windmill. “De Hollandsche Molen”, a Dutch society that worked to preserve windmills, insisted that no more windmills were available to ship out of the Netherlands. Dutch officials weren’t anxious to sell local windmills to foreign buyers. The last windmill to leave the Netherlands had been dismantled to be shipped to Aruba, in the Netherland Antilles for restoration. It was meant to be the last to leave the Netherlands. Dutch officials had to be convinced to sell De Zwann to the Americans. 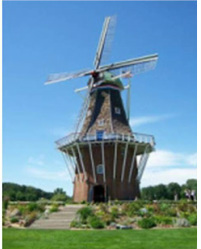 Williard Wichers and a group of citizens from Holland, Michigan,negotiated with De Hollandsche Molen and convinced them that an authentic Dutch windmill in Holland, Michigan would strengthen the cultural and historic ties between The Netherlands and the people of Holland, Michigan. During their search for an authentic Dutch windmill, Willard Wichers and his group spied De Zwaan in the Brabant town of Vinkel. DeZwaan had originally been constructed in the Zaan District in the 1700s and relocated in Vinkel in the 1880s. DeZwaan had been heavily damaged during World War II and three local agencies couldn’t agree about what to do with the windmill. Meanwhile, back in Holland, Michigan, the city had leased approximately 160 acres of land along the Black River near the center of Holland as a site for a park after a group of experts had surveyed the land and recommended it as an ideal windmill location. The City of Holland eventually reclaimed a 36 acre swamp on the eastern end of Lake Macatawa as Windmill Island. The wind had smooth sailing from Lake Michigan, and the Black River threaded its way through a wooded and rustic landscape. It seemed as if Willard Wichers and his committee had bought the Netherlands landscape to transport to Holland as well as the 240-year-old De Zwaan. Holland and its citizens managed the transplanted Netherlands landscape from there. Eventually, De Zwaan and the Netherlands style landscape were expanded to include Windmill Island canals, dikes, and a draw bridge. There were Dutch buildings, farm animals, and tulips. In the years to come, tulips bloomed in numbers vast enough to stretch from the Netherlands to Holland, Michigan, and back, if only in the imaginations of tulip lovers. Workers in the Netherlands dismantled De Zwaan piece by piece and painstakingly packed the windmill into crates and boxes to be shipped to the United States. De Zwaan arrived at the Muskegon, Michigan Harbor on October 6, 1964, aboard the Prins Willem van Oranje. Workers loaded it into a truck and transported it to the site of Windmill Island in Holland. Diek Medendorp and his wife Nellie arrived on October 10, 1964, and he began working to reconstruct De Zwaan with Jacob Jaap de Blecourt, in charge of designing the flower gardens on Windmill Island, assisting him. Del Schrotenboer whose family had roots in Overijssel, the Netherlands, used his company Del Construction, and a crew of local workers to reassemble the windmill. Del Schrotenboer recalled watching Diek Medendorp craft windmill parts with traditional hand tools and old country skills that had been passed down to him through generations. Diek Medendorp trained Del’s brother, Maynard Schrotenboer to be the first American miller of De Zwaan. Maynard learned how to operate the gears and millstone, and how to set the sails and adjust them for wind conditions. He served for two years as De Zwaan’s first American miller, and at the time this was the only job of its kind in the United States. De Zwaan measures 125 feet from the bottom of the ten foot mound to the tip of its upright sail, a height equal to a twelve story building. Narrow stairs lead to the mill’s five floors. The first two floors are inside the brick base and in normal times are used to store up ground grain. The third level, often called the “meal floor,” is used to store ground and bagged grain. The fourth floor holds the millstone and the fifth floor the bins where grain is dumped before it is ground. The mill stocks are steel with wooden lattice sails and canvas or other cloth cover can be substituted to produce additional power. The sail framework is tilted back slightly to catch the full impact of the wind and the wings are curved slightly so the wind strikes them at an angle. During strong winds, workers tie down the sails and the brake is applied to the drive wheel. De Zwaan is the only authentic working Dutch windmill in the United States. The mill grinds an average of nine tons of grain which it sells during the tourist season. During a typical spring on Windmill Island at least 175,000 blooming tulips greet visitors and during the summer and fall the gardens feature colorful annuals. It took about six months to reconstruct De Zwaan to its full 125 feet, but on April 10, 1965, it was formally dedicated on Windmill Island. On Saturday, April 10, 1965, Prince Bernhard of the Netherlands dedicated De Zwaan, along with a distinguished party including Netherlands Ambassador to the United States Carl Willem Schurmann and Michigan Governor George Romney. Maynard recalled that during the dedication a piece of wood broke off from the mill and nearly hit Michigan Governor George Romney and Prince Bernhard of the Netherlands who were pulling on a rope attached to a piece of wood to symbolize the release of the mill’s brake. They brought down the timer instead. Prince Bernhard presented the City of Holland with an antique map of the Zaan district, showing the location of De Zwaan before it was moved to Vinkel. Businessman Carter Brown of the City of Holland accepted the map from the Prince. The Netherlands government flew a bottle of water from the river that flowed past De Zwaan in the Zaan District and presented it to the City of Holland during the ceremonies so that De Zwaan would always have part of its old homeland nearby. The map and the bottle of water were put on permanent display in the mill. Diek Medendorp remained in Holland for most of the summer after De Zwaan was dedicated and he met His Royal Highness Prince Bernhard. Eventually Diek returned to the Netherlands, but he was back in Holland, Michigan at the beginning of the 1966 season to train the new miller, John Heuvel, a Dutch-American from Williamsburg, Virginia. Diek Medendorp decorated De Zwaan’s blades in the traditional Dutch wedding style when Janet Wichers, the daughter of William Wichers who handled the negotiations to bring the windmill to America, got married. Windmill Island grew and continued to expand and its developers asked Diek Medendorp to find an antique Dutch carousel in the Netherlands. He found one in Groningen and in 1972, the carousel became part of Windmill Island. As he trained millers and workers to ensure De Zwaan’s survival, Diek Medendorp made lasting friends, including Maynard Schrotenboer and Bob DeNooyer. He built a one tenth size windmill which DeNooyer later donated to Windmill Island. De Zwaan evoked strong memories for one visitor to Windmill Island. One man who visited De Zwaan every year told mill staff members how he had hid in the windmill when he was a boy in the Netherlands during World War II. When the Nazis came to arrest him for trying to save a Jewish boy, the man fled his town. While the Nazis searched for him, he climbed into the mill and hid between the millstones for several hours. After he had immigrated to Indiana, he would visit De Zwaan every year and reminisce to employees. At anniversary reunions, De Zwaan employees who worked on Windmill Island since it opened to tourists in 1965, reminisce and make video tapes recording their experiences. Former Holland City Mayor Al McGeehan was one of the over 200 former “windmill islanders” and their families with fond memories. He and others like him remained supporters of Windmill Island and were instrumental in adding banquet facilities and other amenities to the Island. A Tulip Festival is held every year in May. Windmill Island also features a canal with a Dutch drawbridge, a 1631 gabled farmstead, and several wood frame Zaandam houses. When the winds blow at about 15-20 miles per hour from the west, De Zwaan’s 80 foot blades turn in the wind as they have done for centuries. On January 4, 2011, Diek Medendorp died in Zuidlaren, the Netherlands, at age 89. In Holland, Michigan, following Dutch windmill tradition the blades of De Zwaan were set in the mourning position. De Zwaan remained shrouded in black sails for three days to mourn Diek Medendorp who reassembled the 250 year old De Zwaan. De Zwaan still operates as steadfastly and steadily as the wind blowing its sails through the past, present, and future. The windmill is a living memorial to Diek Medendorp whose life and work tie Holland, Michigan, and the Netherlands even more closely together. and Heritage, the Holland Michigan Story. 2000. Van Beck, Harley. Come Tip-Toe Through the Tulip City, 1960. Van Reken, Donald. A Brief History of Holland, Michigan. 1977.